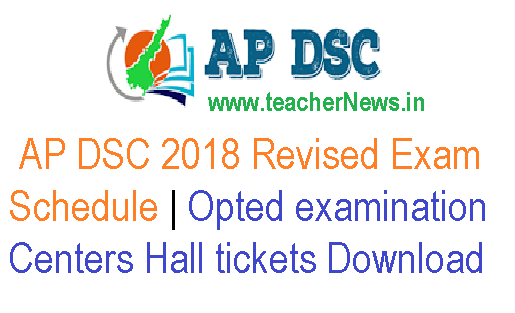 AP DSC 2018 Revised Exam Schedule | Opted examination centers Hall tickets at apdsc.apcfss.in. : AP DSC 2018 Revised exam schedule / Acknowledgement /Exam center availability report /Schedule for opted examination centers. 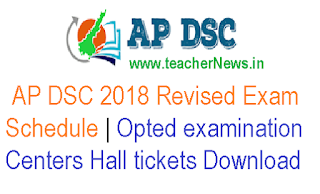 AP DSC (TRT) 2018 Revised exam schedule / Acknowledgement / Exam center availability report /Schedule for opted examination centers for Revised Examination Schedule download. AP DSC 2018 Revised exam schedule / Acknowledgement / Exam center availability report /Schedule for opted examination centers at https://apdsc.apcfss.in/.